1. It's all about the Collection Concealer- this stuff covers anything so just blend it over blemishes, redness, pores, dark circles and whatever else might be going on and you're already further to foundation free flawless. 2. Bronze it up. 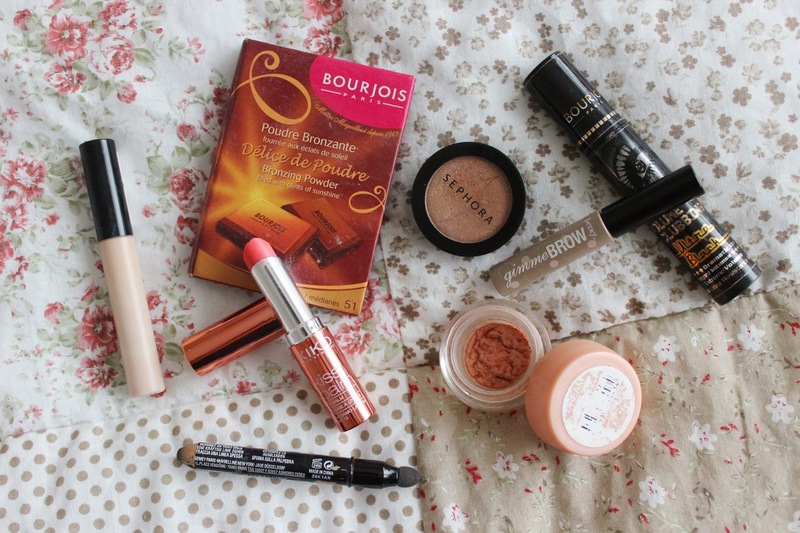 It's a whole lot easier to strip back the base if you're bronzed, so fake tan if you can but if not just be liberal with the good old Bourjois Chocolate Bronzer. 3. Add a subtle pop of colour to liven up the look. The peachy Maybelline Cream Blushes are perfect for this as the cream texture will give you a beautiful glowy sheen. 4. Dem brows. In this Cara Delevingne era it's more important to have your brows on than almost anything else, but obviously you want don't want to go all out so popping Benefit Gimme Brow through them gives great subtle definition and volume. 5. Bring the focus to the eyes now with a wash of neutral shadow over the lid and under the waterline to make you feel a little more done. This Sephora Copper Shadow is my new fave. 6. You could leave the liner but I think smudging the Maybelline Master Smokey round the corners of your eye gives the illusion that you've put more effort into your makeup and makes you look more awake. 7. Apply mascara as usual -I'm still in my Bourjois Volume Clubbing phase- but just don't go too spidery. 8. This is when tinted lip balm comes into it's own as it offers a subtle pop of colour alongside lazy day replenishment. I'm obsessed with the Kiko Kiss Balm that I bought from Barcelona but you all know the baby lips and rosy pot Vaseline deal. And voila! A fresh and natural pretty look perfect for weekends and when you're running late in the mornings. You glow girl! Will you brave the foundation free face? Im loving the no foundation look at the moment, my skin feels so much lighter and It means you can see my freckles which I quite like. I also find I'm getting less spots with wearing less make up. Your skin looks so glowy and healthy :) I have a lot of scars so if I want to look nice I do wear foundation, but most days I don't bother. 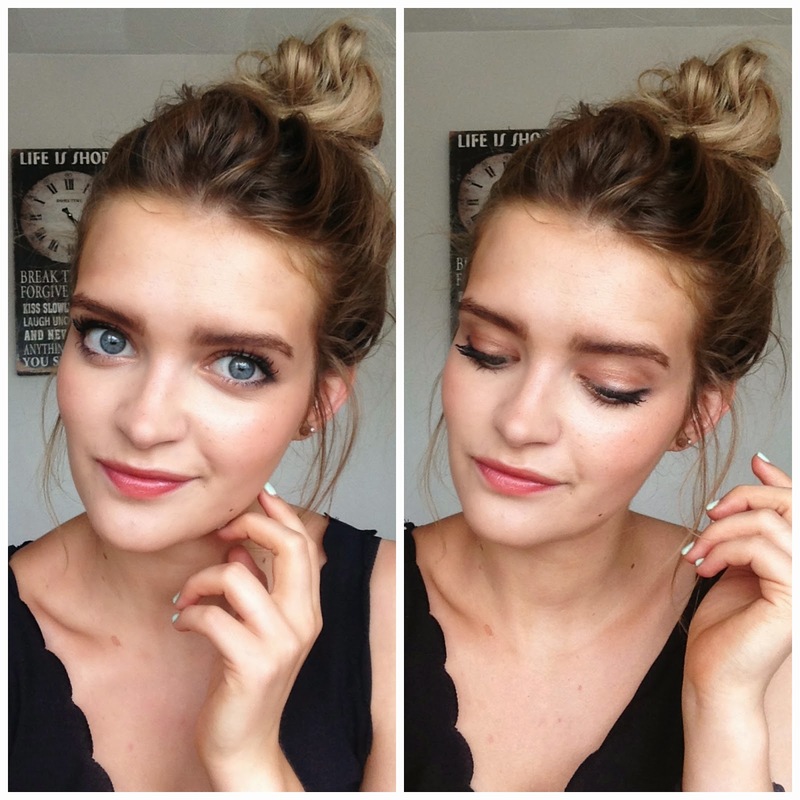 I've been loving the no foundation look recently, it's great to give your skin a break especially in the summertime! I absolutely love this look! Definitely want to recreate the eye makeup! I really want to get my hands on that Bourjois chocolate bronzer, but unfortunately it's not sold in the states and it's sold out online. Love that topknot by the way! Wow! I wish I looked like this without foundation, you look absolutely gorgeous Meg!